Yep, you read that title right…Taco Tuesday!! It’s been awhile, I know…but boy do I have a good ‘un for you today!! I actually had these on the menu for weeks and it just kept getting pushed back over and over and…well, you get the gist. But finally I got them made and thank goodness I did!! 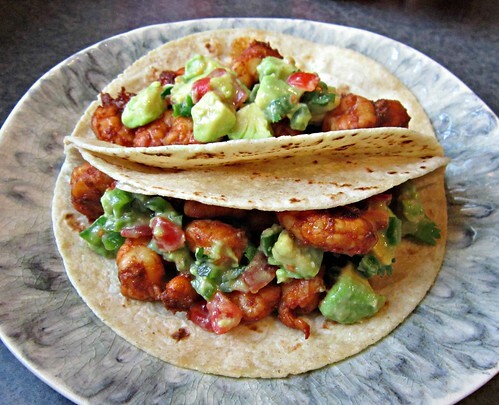 Who doesn’t like a slightly spicy shrimp taco, topped with a creamy, refreshing avocado salsa? No one I know, that’s for sure!! And I love how the spices actually, visibly stuck to the shrimp. I’ve made some in the past that didn’t quite have the flavor stick and it was very disappointing. Not these, though. Not a hint of disappointment. Only lots of yummy flavor and deliciousness. And no, this isn’t an April Fool’s joke…they really are delicious. I wouldn’t joke about food, y’all! So, in honor of a long overdue Taco Tuesday post, I think you all should make these tacos tonight!! Then let me know how much you love them, too!! To make the Red Chile Paste – Cut the chiles into flat pieces, remove the seeds and veins. In a skillet over medium, heat for about 3 minutes, turning half-way through, until they start to soften. Place chiles in a blender, cover with boiling water, and let sit for 30 minutes. After 30 minutes, pour out the water leaving the chiles in the blender. Add remaining ingredients. Plus until smooth. Add water, a little at a time, to thin out as necessary. Place the shrimp in a bowl or resealable plastic bag and pour 1/3 cup (or more if you want) of the red chile paste over the top. Mix the shrimp so that all are coated and marinate for about 30 minutes. Heat olive oil in a skillet over medium-high heat. Add the shrimp and cook for 3 minutes per side, or until cooked through. 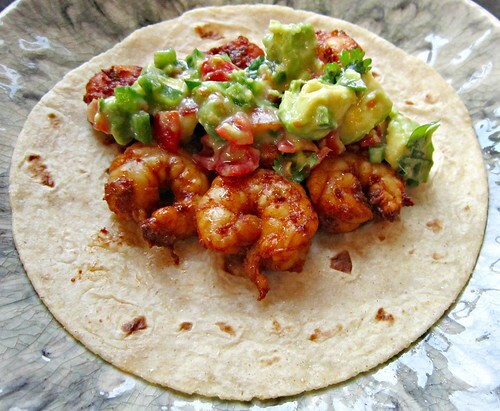 Serve shrimp in warmed tortillas topped with avocado salsa.